This luxury, designer apartment is situated right in the centre of Barcelona, home to some fantastic restaurants and stores. 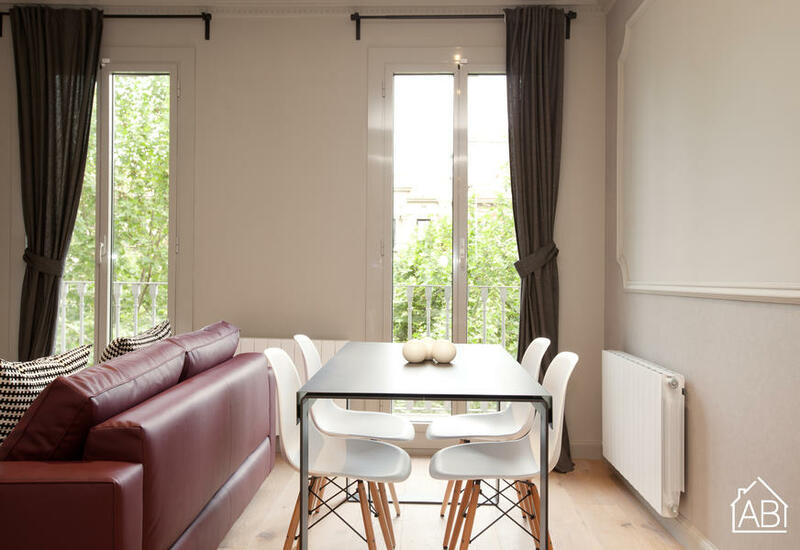 It can be found only a short walk from Las Ramblas and Passeig de Gràcia, a paradise for shopping and fine dining, as well as Plaça d’Espanya, where the colorful Montjuïc Magic Fountain and MNAC museum reside. Surrounded by a handful of metro stations, you will be able to get to all of the best sights in the city easily. This 2 bedroom 2 bathroom apartment is designed to feel like a home away from home. The state-of-the-art kitchen is fully equipped with the highest quality appliances. This Barcelona apartment includes a dishwasher and washing machine for your convenience. Complete with an Internet connection, this recently renovated apartment also has a 24 hour concierge service should you have any questions or need any assistance during your time in the city. What´s more, the building is equipped with security cameras throughout. What´s more, you can make the most of the 150m2 communal terrace, complete with sun loungers during your time in this wonderful apartment.